GOMA, Democratic Republic of Congo — News reached Goma yesterday that Col. Baudouin Ngaruye, one of Bosco Ntaganda’s most important allies, has accepted to be transferred to South Kivu. Baudouin, who controlled parts of Masisi around Mushaki and Ngungu, defected along with about 17 other ex-CNDP officers under Ntaganda’s order a few weeks ago. While the majority of the defectors have, in the meantime, returned to the army or been arrested, Baudouin has until now provided for Ntaganda’s personal security in Ngungu where he has retreated. According to Enough’s sources, about 100 of Baudouin’s troops have left for South Kivu with around 10 trucks full of weapons and ammunition, while Baudouin is making a stop in Goma before heading south as well. 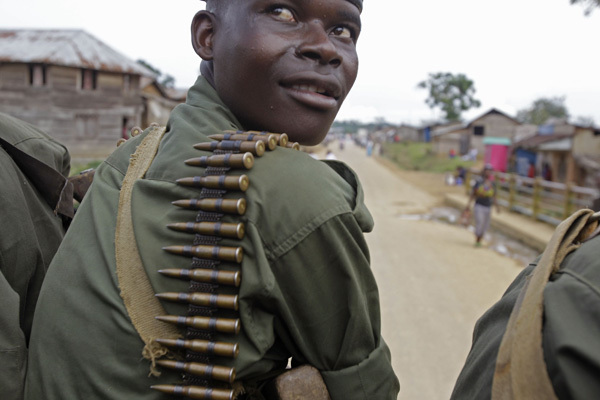 Baudouin’s transfer is the result of Kabila’s announced army restructuring in the Kivus. Col. Innocent Kabundi has reportedly been assigned to take over Baudouin’s are of control in Masisi. This change of control will certainly have an impact on future developments related to the defectors who are in Masisi territory. It’s still a looming question whether Ntaganda will accept to retire to Ngungu, as many in Goma speculate is the most probable scenario for the defecting commander, now that the area is controlled by a Kabila loyalist. The reason behind Baudouin’s acceptance to be transferred away from the ex-CNDP strongholds in Masisi is uncertain, but the amount of ammunition his troops took along could point to an attempt to expand the area of control held by Ntaganda’s loyalists down to South Kivu. This would also be in line with Ntaganda’s latest efforts to draw new recruits to his movement. On his way to Ngungu, Ntaganda first went to Bwiza inside Virunga Park, where the ex-CNDP has a secret training camp. Ntaganda then visited Kabati before traveling to Ngungu, trying to rally new Tutsi combatants along the way. Ngungu was also wisely selected as his base as an important arms hideout is not far away in Rusekero. While most ex-CNDP defectors have gone back to the army, Bosco Ntaganda and his close allies, arguably still including Baudouin, seem to still be trying to amass new recruits and ammunition and to expand their area of control. A new rebellion might still be in the making, despite a relative return of calm since the mutiny started a few weeks ago.